"I think with the death penalty, we've crossed the tipping point on the question of innocence," one expert said. And in early March, he took to the House floor to encourage his colleagues to support his bill to abolish capital punishment in his home state — the bipartisan fruit of about six years of work in the Legislature, the Democratic lawmaker said, and one that comes 21 years since he sponsored his first piece of legislation aimed at repeal. "To me, it was hanging on to my values as a victim," Cushing, 66, told NBC News of his decadeslong effort. "I know that in the aftermath of murder, having a ritual killing by government employees of an incapacitated prisoner doesn’t do anything to bring either my father or my brother-in-law back," he added. "It just really fills another coffin and widens the pain." New Hampshire, where one person remains on death row, is just one of at least 15 states to take steps toward ending capital punishment so far this legislative session, according to the DPIC. That includes California, the state with the nation's largest death row of 737 people, where Democratic Gov. Gavin Newsom placed a moratorium on the state's death penalty in early March. Already, 20 states and the District of Columbia have outlawed capital punishment, while three other states have a governor-issued moratorium. "I think with the death penalty, we've crossed the tipping point on the question of innocence," Dunham said of the uptick in state-level repeal efforts. "Every person who looks at the facts in good faith agrees that people who are innocent are at risk of being sentenced to death and being executed." Lawmakers and criminal justice reform advocates who have led the push for repeal say it's an ineffective, medieval form of punishment that wastes taxpayer dollars, ensnares innocent people, discriminates against minorities and the poor while also violating moral or religious codes. Those opposed to such efforts argue that the death penalty is an effective deterrent to crime, necessary for public safety — and is the only punishment appropriate for the most heinous offenses. In Colorado, where a bill to end the state's use of the death penalty died last Tuesday in the state Senate, all three of the men on death row are from the same county. Colorado state Sen. Angela Williams, D-Denver, said that capital punishment discriminates not only by race, but also by place. "The three men on death row are all African American. They all went to the same high school. They’re all from Arapahoe County. All of their cases were prosecuted in the 18th Judicial District," Williams said in an interview prior to the bill being withdrawn from consideration. "As an African American woman who has worked on criminal justice reforms in the past, I am greatly concerned about the inequity of this application in Colorado." Still, divisions remain. Despite Democrats holding a majority in both the state Senate and House, it was unclear if there would have been enough votes for the repeal to pass, according The Denver Post. Those opposed to the proposal accused those in favor of rushing the process. And on Tuesday, one of the bill's co-sponsors announced to the general assembly through tears that she was withdrawing the bill from consideration. Prior to the bill being withdrawn, Dunham had pointed to Colorado as an example of the increasingly bipartisan nature of the debate surrounding the repeal of the death penalty. "Just looking at Colorado, which has a Democratic majority," Dunham said. "If this were a partisan issue, then that vote would have been rammed through already, but there are Democrats who are opposed to repeal." Those Democrats who oppose it include state Rep. Tom Sullivan, D-Arapahoe 37, who lost his son in the mass shooting in Aurora in 2012, and state Sen. Rhonda Fields, D-Arapahoe 29, whose son and his fiancée were murdered in 2005. Two of three men on death row in the state are there in connection to the killings. Fields proposed that Colorado voters — not its lawmakers — decide whether or not to abolish the death penalty. "I believe we should trust Colorado voters to have the final say on such an important matter," she tweeted March 11. 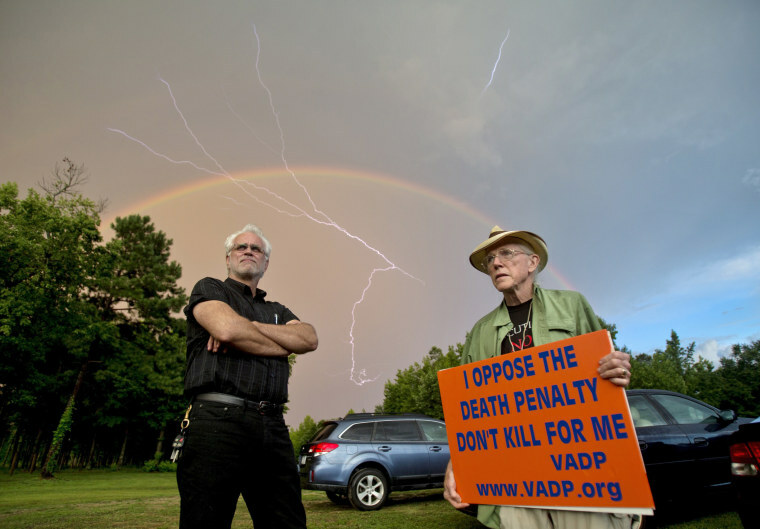 Kent Scheidegger, legal director of the Criminal Justice Legal Foundation, said he supports the death penalty and has worked on cases supporting the rights of victims since the mid-1980s. He also believes that public opinion should be taken into account on this matter, particularly in California after a 2016 ballot poll indicated that the majority of voters supported the death penalty. Repeal "was on the ballot and the people voted on it and the people made their decision,” Scheidegger said of the recent moratorium issued by Newsom. "The governor is spitting in the face of democracy to misuse the clemency power to effectively repeal a law. He has a constitutional duty to see that the law is faithfully executed and he is in gross violation of that duty." Colorado state Sen. John Cooke, R-Weld 13, said that as a former sheriff, preserving the option of capital punishment is necessary. "You see the things that people do to other people, there’s just pure evil out there. Those people need to pay the ultimate price for what they've done," Cooke, who opposed the repeal bill's advancement, said. In Washington state, where Democrats have the majority in both chambers of the legislature, prospects for repeal appear brighter. After the state Supreme Court's unanimous vote in October 2018 against capital punishment, in which the justices said it was "imposed in an arbitrary and racially biased manner," a bill ending its use passed the state Senate earlier this year. The House Committee for Public Safety voted to advance the bill April 1, and the full House is expected to vote on it in the coming weeks. Gov. Jay Inslee, who is running for the 2020 Democratic presidential nomination, said that he would sign the bill, according to The Associated Press. Hannah Cox, the national manager of Conservatives Concerned About the Death Penalty, said that while the issue of repealing the death penalty was once a partisan one, that's changing. It "was virtually unheard of in 2012 for a Republican lawmaker to sponsor repeal," Cox said. This year, ten states have had Republican-sponsored legislation aimed at doing away with capital punishment, according to her grassroots advocacy group. That includes Georgia, where the bipartisan House Bill 702 was introduced on March 28 backed by the Ways and Means committee chairman and boasting two other GOP co-sponsors. “Times are different. People are just recognizing the flaws in the criminal justice system and I think viewpoints are really, really different than they were in the '90s on this issue," Cox said. "The legislation in New Hampshire has always been bipartisan and it is this year again. The past two years, Republicans have taken the lead," he added. His bill passed the state House with a vote of 279-88 and Cushing expects it to be considered by the full Senate soon. Though Republican Gov. Chris Sununu has vowed to veto it — just like he rejected almost identical legislation last year — Cushing said he thinks the strong show of support in the House bodes well for the possibility of overriding a veto, which would need a two-thirds majority from both legislative chambers to pass. Savannah Smith is a politics intern for NBC News digital, based in New York.